Hello all! We're here today to celebrate the springtime projects you shared with us in April - and what a lot of wonderful entries there were. You certainly made life hard for Monika. As she said: I think I had the most difficult task to choose 4 pieces from the stunning entries of our April’s Challenge. It seemed an impossible mission (mission impossible - LOL) to find just 4 creations!!! 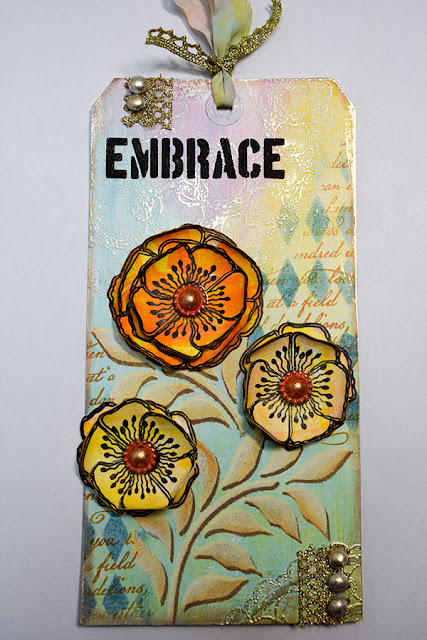 But before we get to those top picks, here's our PaperArtsy Infusions winner chosen by Mr Random Generator. And that's Akshma of Akshma Creations with these charming cards. Congratulations Akshma! Your winner's badge and PaperArtsy Infusions will be on the way to you shortly, and we hope you'll join us as a Guest Designer here at Country View Challenges in the months to come. Monika said: This is a delightful shabby chic card with Graphic45 papers! I love the trio of the purple, green and soft pink colours! The handmade flowers are so beautiful! This feminine card is a perfect gift for Mother’s Day! Monika said: This is an interesting mixed media canvas with a dimensional wreath on it! I love the bright spring colours of the flowers contrasting with the black background! Monika said: This is a fabulous tag! I loved the way Etsuko made the flowers and how she used the bump technique through the PaperArtsy stencil. I loved the little shimmers and the definitely spring colours! And last but certainly not least, here is Monika's choice for her Design Team Member's Special Mention. 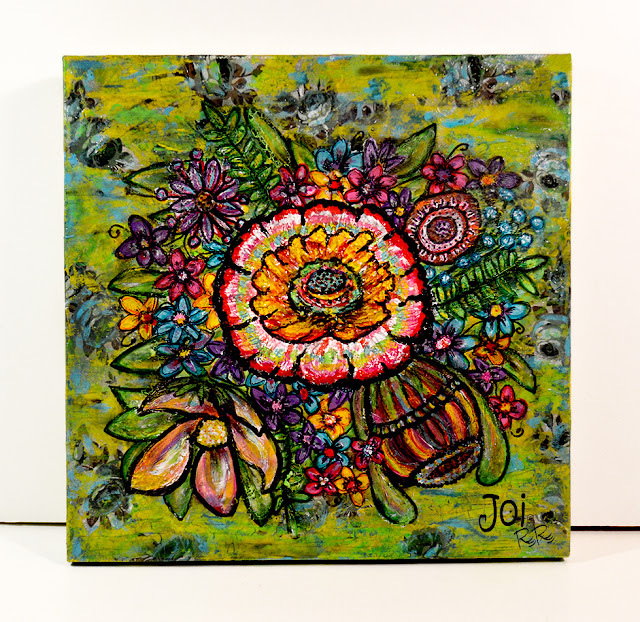 Monika said: I love the bright and vivid colours of the flowers and the whole canvas! I love that this is a unique creation, a real mixed media painting with many layers and many crackles! The center flower is just amazing! Warm congratulations to all our winners. Your badges will be on the way to you shortly, and we hope you'll display them with pride. And thank you again to all of you who played along. You certainly shared the joy of springtime crafting with us, and we enjoyed visiting each and every one of you. Don't forget our May Challenge - Use a Stencil - is now underway, as well as our exciting Birthday Bloghop, with the amazing prize of a Sizzix BigShot Machine & Die Bundle. You can enter both the challenge and the bloghop, or you might just want to enter one or the other. You'll find all the details here, so we hope you'll come and play and hop along! Congrats to everyone! Beautiful inspiration!!! Congratulations to the winners for their fantastic works and thanks for all the entries! Congratulations to Sara, Jenny, Akshma and Etsuko. WONDERFUL WINNERS. Your work is just lovely. And THANK YOU ALL SO MUCH for giving my canvas Design Team Special Mention. It means a lot to me! Xj. 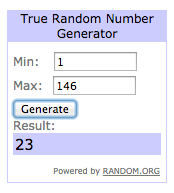 So sorry I'm late to the party, but what a fabulous party it is, with all the beautiful creations chosen as winner, Top 3, and a wonderful Special Mention! I thought Joi's colorful, crackled canvas was deserving of very special mention myself! I am pinching myself, and beyond tickled pink to see my Mother's Day card listed as one of the Top 3! My Mom loved it, too! Big hugs to Monika and congratulations to all the deserving winners!